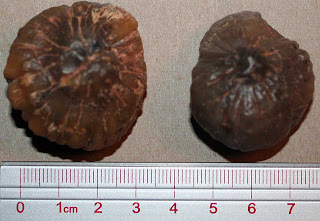 Arucaria mirabilis fossil "seedlings" (lignotubers) found in the petrified forest formation of Cerro Madre Ehija, Santa Cruz province, Argentina. 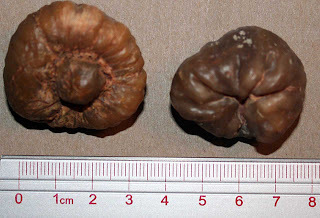 Fossil dates to the Middle Jurassic Period (Callovian) or about 160 million years old. Learn more about this fossil at The Virtual Fossil Museum web site and Wikipedia. UPDATED: Thanks to Dave at Views of the Mahantango for pointing out that these fossils were once considered "seedlings" are now thought to be lignotubers. According to Wikipedia, lignotubers are "starchy swellings of the root crown". Thanks to Mark Palatas for letting me photograph these specimens.